Just remember, these are just my thoughts and onvservations ! Type D - There's also the black and red look with a black spiked spiked collar, black gazelle horns, and a black worn. Or as I call it, "The Edgy"
Another thing to mention is that people only use about 6 different animals. AJ is mostly made up of arctic wolves, there's an equal amount of bunnies and regular wolves, occasionally some tigers and eagles, and then there's some of the newest animal. What ever happened to originality? 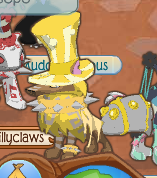 Why does everyone have to use the same animals with the same exact outfit? I don't get it! You know those glitched Festive Lights from a while ago? Yeah well those are everywhere! I have no idea why these bother me so much. I have no good reason. Back in 2011 we even had our own "slang" like how we called Elf Bracelets "cuffs"
There are two different cases of this. The first one is for scamming. People will find a random item, call it glitched, and expect people to fall for it and get rich in "spikes" and "hd's"
These are what we call "liars"
I see people asking "when did this come out?" and stuff like that. Sometimes I see "famous" AJ people get asked these kinds of questions. But I always see people give the wrong answers, like "this item came out in 2009"
This goes with the above thing but it deserves its own section. How people call everything "beta"
When I discovered "beta hoods" I named them "beta arctic hoods"
I don't know what happened, but something happened in 2012 or 2013. My guess it someone had the idea that a color of an item that isn't for sale is called a "beta" color. And then it spread. Now almost everything is called "beta"
"Trade me beta spike!" 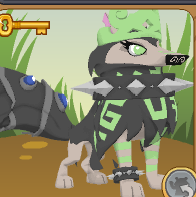 "give me 12 den betas for my edgy collar!" Even some of those parties made with that new party feature are called "Beta Beta Beta"
I'm sure most of these people don't even pronounce it right. It's supposed to be pronounce like "bait uh" and not "bet uh"
When those items came back the other day in that party people were complaining (and still are) that those items "aren't beta anymore"
Sometimes people say "this item is more beta than this item"
Beta is not a descriptive word, people! It's a testing phase! I had an argument with someone about when AJ started and about what beta means. They seriously believed beta means "cool and interesting things"
Another thing I honestly don't get. I tried to understand this but I just don't. Just like how I see 27 of the same outfit in every room, I see 27 people saying "trade attempts for (item)!" or "doing trade attempts for (item) be fair!" and the strangest one, "recording trade attempts for (item)"
If I understand correctly, these "trade attempts" are just having an item on their trade list. So why say "doing attempts for (item)" when you can just say "(item) on trade!" ? You're just creating more work for yourself, aren't you? And then there are the ones that say "doing trade attempts for (item)! i might accept!" Doesn't that imply that all these other "trade attempters" will never accept? I mean, it's a trade, there's always supposed to be a possibility that you might accept. So why mention it? I don't get it. Are trade attempts just people putting items on there list and never accepting? If that's the case then what's the point of offering? And what I really don't get is the ones that record it. I don't watch AJ videos for several reasons so I don't know (hopefully someone could kindly tell us) but what's so interesting about a video where you just decline trades for 10 minutes? I tend to not check my Jam a Grams anymore because of how many of these messages I get. It's kinda of annoying. Then I get people to come over to me yelling at me for not responding to them. You just talked to me out loud then, why couldn't you have asked me out loud instead of through Jam a Grams? I don't wouldn't want to use the horrible typing system in Jam a Grams anyway. In the past people would almost never ask through Jam a Grams. Why did they start now? Is there something wrong with walking over to someone and asking them what they want out loud all of a sudden? Spiked collars that aren't black or "long"
I might have missed a few items but basically anything that isn't on this list is complete trash and has no value. At least that's the way I see it. So there's only like 20 items that people trade... 20 out of the 1000s of items this game has. I just don't see the point of trading when only 20 items have value. And most of these items aren't even rare! 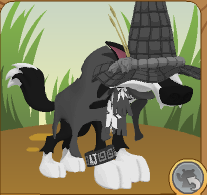 Black spiked collars are the "rarest" yet I almost never see anyone wearing one that isn't black. 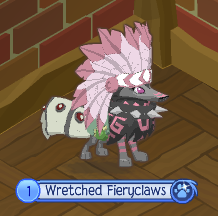 Same thing goes for light pink headdresses. How is it that the most common items are the rarest? "THAT WAS FAIR WHY DIDN'T YOU ACCEPT"
I'm sorry but I don't see how two of one of the most common items for my very uncommon item is "fair"
See, this is why I don't play AJ any more. omg u stink ur jus jelis that we r betr then u !!!! 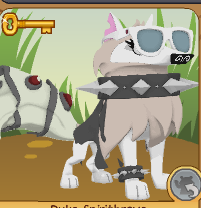 Lol I used to be one of those people who freaked out about rares, wore one of those stereotypical outfits (outfit D), buddied people only for their rares, and chased then around jamagramming them "what for spike" and then I took it to far and turned into one of those people who lies down, puts on a crying emoji, and waits for someone to say "What's wrong?" No more trust trade scams! Woohoo! Oh yeah the light pink headdresses? I also hate it when people think spiekz and Rare Item Monday's are everything. I don't get the Phantom rugs craze. It was a rug that was sold for ages then went on clearance. 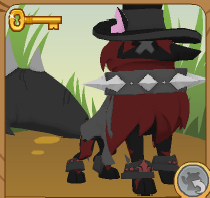 You know, fox hats are extremely UNDERRATED, sure you can get them in Search For Greely Hard Mode, but they're still rare, nobody ever asks for those, they're all like OMG THAT'S NOT RARE, GIMME A BLACK LONG SPIKE! If you're going to kill me, how will I go die in a hole? Spring is here (where I live it's January 10) so hooray for warm temps! OMG you swore! How dare you swear? I have never even DREAMED of someone swearing in comments! What a horrible thing to do, I can't believe anyone would ever SWEAR in a comment! berdstick is betr than u melotata! Sad cry or happy cry? Those are pretty good points:) And all of them aswell. 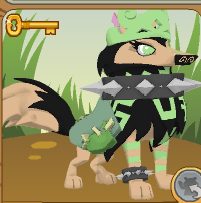 I think someone should make a movement for STOP JAMMERS WHO WANT RARES! Actually I'm gonna do that when I get a chance and if I remember... Will you ever change the header, template, and background of your blog? So apparently there's a shark cage craze in the Aldan I went to. 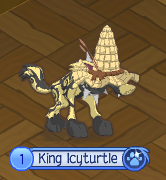 I've never seen the item myself but now everyone has/wants one?? KuruKuruTako, your blog is trash and worse than my cat's barf. You smell like poop too. Does your cat's barf have a blog? So it's good smelling cat barf? Ya I always am getting offers for my "glitches" nerd glasses. Time after time I tell people they aren't for trade but thousands of people still Jamal gram me non stop. Another thing is I can't really go almost anywhere now without someone freaking out because I'm a nonmember arctic fox. Tons of people add me these days but never even talk to me. And there is always someone who announces "OMG A NOMMEMBER ARCTIC FOX"
Stop criticising spikes. Just because YOU don't like them doesn't mean you have to call people who do garbage. 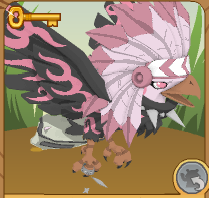 I mean, I hate how you think your 'so cool' with that beta tail that is on almost EVERYONE IN ALDAN!!! It's rarer then a spike. Your jealous we were smart enough to find a cool item and YOU wanted to choose it. Well, you have NO FEELINGS cause when almost every player on AJ has worked their butts off to get these items they thought were cool and rare. 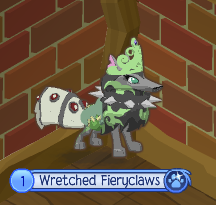 Finally get them, then the people that hate spikes take over and they have to start ALL OVER AGAIN TO GET A FRIGGING GOOD ITEM CAUSE YOU BULLIED THEM I WILL HACK YOU AND RECYCLE ALL YOUR ITENS AND MAKE YOU FEEL SORRY YOU EVER SAID THAT THE NEXT TIME YOU TALK JUNK ABOUT SPIKES GOT IT? This kind of stuff happens on every single rant or opinionated post on the internet so it's to be expected"
Ur a ugalie bat had 4 saing spice dollar is nawt kuol!1!1!11!!111!!!!! I whal repurt ur bootie own ajaye shawt owp luzer!1!!1!1!!1111!! 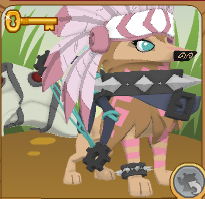 For the overused outfits, don't forget the one that's just a spike and a baseball cap! Haha yeah, you also can't go into the Pillow Room without seeing that look. oh my gosh i wanna rip my hair out every time someone says "trads meh betty elf tals"
I once won two spikes from two days in a row, but I just gifted them to my buddies because I wasn't interested. 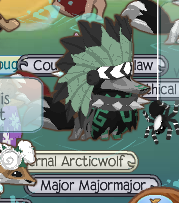 When I go to Aldan, it's just the same old Arctic wolves with Headdresses, spiked collars and more ''rare'' stuff they have. People need variety..